Blogging every day. 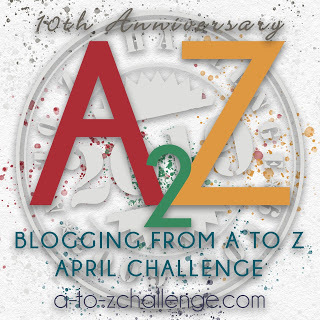 It starts on April First with a topic themed on something beginning with the letter A, then every day in April, (with the exception of Sundays) another topic continuing through the alphabet ending with, of course the letter Z.
I really don’t have a theme. Some will be fiction. Mostly whatever strikes my fancy. Another visit with Fran who first made two appearances as the F and K posts in last’s years AtoZ challenge. On a chilly, early spring morning, Fran sat on a freshly painted, dark green bench and looked out at the ocean. The bench was anchored onto a wooden deck set high up on the man-made dunes. Normally she would have walked along the water, picking up shells, but the beach was terribly eroded from destructive winter storms and there was a ten-foot drop down onto the shoreline. She closed her eyes and let the ocean breeze caress her face. Her hands snuggled in the warmth of the wool of her well-worn fingerless gloves, her bare fingers wrapped around a white Styrofoam cup of steaming hot tea. Of course, Fran suspected that Gina wouldn't be all that surprised. After 25 years at the halfway house, it was hard to pull the wool over her eyes. She tried to reassure herself. No, it couldn't be she thought. Fran slowly turned around and saw the fisherman struggling to climb up the steep sand dune. As he got closer, she squinted and raised her hand up to shade her eyes from the bright sun, trying to see if it was he. But by then she already knew that it was. It was Tom. He was the only one who ever called her Frankie. She wanted to run. Run as fast as she could, down the planked path to the parking lot. But she was frozen and like a deer caught in the headlights, she couldn't move. Two years ago was the last time she had seen him. As she waited for him to make his way towards her she thought about the day they first met. January 14. She would never forget it. It had been a cold dank morning with a smoky gray snow sky. She could still recall shivering as she waited outside of the rehab. Gina was to pick her up to bring her to the halfway house. When she and Gina got to the residential facility called “Gina’s Way”, Tom was the one who had greeted them at the front door. Now as she reflected back on that day, she remembered that she had barely noticed him. She had been too nervous and afraid. She didn't want to be left there. She didn't want Gina to leave. "I'll come by tomorrow," promised Gina. "Can't you stay? Just a little longer?" Fran begged. "Listen, Fran, you're going to be fine. I just know it." "Besides, I have the group waiting for me. You know we are going to be finishing up our gloves tonight," Gina said. She shook her head back and forth, as if the movement would chase the memory from her mind. Slowly looking up she saw that Tom was now on the wooden deck at the top of the dunes, just a few yards from her. Fran clutched her hands together; her bare fingers peeked out of the faded red fingerless gloves. Gina had given the gloves to Fran. "I knit them just for you, Fran," said Gina. "Do you think I can learn to do that?" asked Fran. Gina assured Fran, “Of course you can,” she said. At first, Fran could hardly keep her shaky hands still enough to hold onto the wooden needles. But Gina would put her hands over Fran's to guide her through the stitches. "First, make an X with the needles, like this," Gina said, demonstrating. "You see, the needle in your right hand goes into the loop on the left needle. That's it, place the right needle behind the left." "No, no, it has to go behind the one in your left, like an X," Gina patiently explained. "Here's an easy way to remember," said Gina. "That's it!" You've got it!" exclaimed Gina when Fran completed her first stitch. She remembered the very first thing she made. It was a garter stitch scarf in scratchy blue wool. By the time she finished it, the scarf was full of holes where she'd dropped stitches and one side was uneven. Gina made a fuss over it, though, praising Fran for not giving up. Finishing that scarf gave Fran hope that this time she might also be able to stick with the program. Gina and knitting. The were now the tightly interwoven threads of Fran's complex life. He stood in front of her. She lifted her eyes to look up at him. He was wearing the blue scarf. Her heart began to thump rapidly in her chest. She grabbed onto the handrail to steady herself. Her mind was racing. Her emotions were like a ball in an arcade game ping ponging all over the place. Anger hit the jackpot. Bing, bing, bing! Without thinking she reached up and punched him in the arm. She could not seem to organize her scattered thoughts into a coherent sentence. He gently placed his hands on her arms pulling her towards him. Fran wriggled out of his arms and pushed him away. She felt a searing pain, deep in her being, as the wound she had so carefully tended to began to rip open. “I’ve got to go!” Fran turned and ran down the ramp. Tom stayed at the top of the deck. He did not call after her. He did not follow. When Fran got to her car she turned, half expecting Tom to be right there. She knew she would have to face him sooner or later, but tonight belonged to Gina. As she drove the 20 miles back to “Gina House”, she thought about the last night she and Tom spent together. She was so happy. She thought he was happy too. He told her he was. They had sat on the front porch of “Gina House” and planned an early breakfast the next morning. Then they were going to begin their apartment search. He told her he had some things to take care of so he would have to call it an early night. “Urgh!” She growled out loud. She didn’t want to think about those times. She especially did not ant to think about that night, that last night. It had taken Fran months to trust him. But, slowly she began to open up to him. He knew about her father and the hurt. It was after that time, the time she told him about her father that Tom began call her Frankie. “Fran is the little hurt girl”, he said. She even began to think of herself as Frankie. The day he left her, waiting for him on the front porch, she became Fran again, fragile as a hurt little girl. I sure hope we don’t have to wait another whole year for Fran to make an appearance, right? I hope we don't have to wait a year! I came into the game late (for Frankie, anyway). Thanks for posting the two back stories! Ah yes, I do remember this story. Glad you've picked it up again.